Blazing Star is a scrolling shooter video game for the Neo Geo home game system. It is the sequel to the acclaimed Neo Geo shooter Pulstar, which was itself a close cousin to the R-Type franchise. A typically hefty Neo Geo ROM at 346 Mb, the game makes extensive use of pseudo-3D prerendered sprites, brief anime and CGI cutscenes (mostly during the intro sequence), and frequent Engrish voice samples and captions. While Blazing Star was superior in many respects to previous shooter games, some fans compare it unfavorably with Pulstar on the basis that Blazing Star was overly easy and there are those that prefer the simpler 2D sprite look over the prerendered sprites that came to dominate many of the more recent shoot-em-ups. 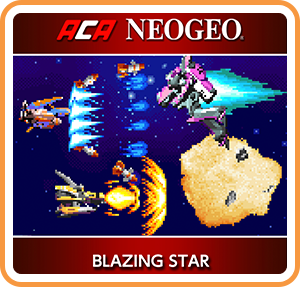 Where can I buy ACA NEOGEO BLAZING STAR physical/digital?